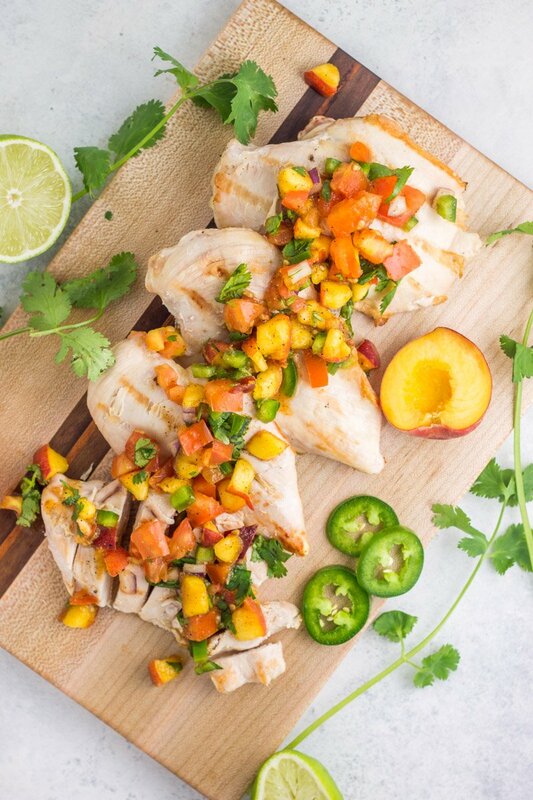 A simple salsa to top grilled, lean protein for a flavorful dinner your whole crew will love. 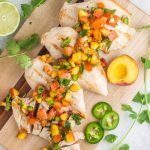 These grilled chicken breasts with jalapeño peach salsa is Whole30 compliant and uses simple ingredients to pack a big punch. Thank heavens for neighbors. Especially the ones that offer free stuff. Ok I know there’s a lot more to having friendly neighbor relations than what they give you, but for the sake of this post, let’s just focus on the reasons why I love my neighbors. 1.) they have herb gardens and an open invitation for me to cut off what I need, whenever I need it 2.) they tolerate my desperate food blogger texts begging for a jar of cumin or a can of tomato sauce when I’m out 3.) when their peach tree overproduces, they set out a box of free peaches begging someone to take them. So I guess to key to my heart with friends is food. Shocker. Call me lame, I call it resourceful. 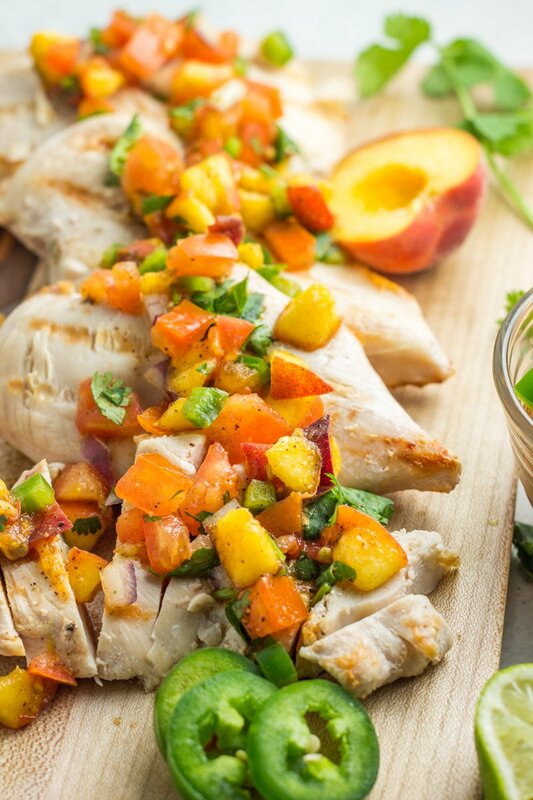 Especially when it yields recipes like grilled chicken breasts with jalapeño peach salsa. Lately I’ve heard some chatter in the blogging world – some food bloggers make these crazy amazing creations and never eat them. I don’t know if this is true, maybe it’s just some big, nasty rumor. But this budget-conscious family eats every.single.thing.I.make. And that means when there’s free produce offered to me, I take it and figure out how to make something easy, good, share-worthy my online peeps, and my family. Even if it means we are eating peaches for weeks. No shame in my game! So when I walked up to my neighbor’s doorstep with my reusable grocery bag and started throwing peaches in my bag as giddy as a child grabbing Halloween candy from a ‘free for all’ bowl, my brain was buzzing with something I could create with the fuzzy little beauties. Here’s the deal, this recipe isn’t insanely inventive, or some crazy new way to peach it up this summer. But it’s easy, it’s good, it’s a crowd pleaser, and it’s Whole30. Oh, and it’s a fab way to get the kids to eat protein, because really, what kid doesn’t like peaches? 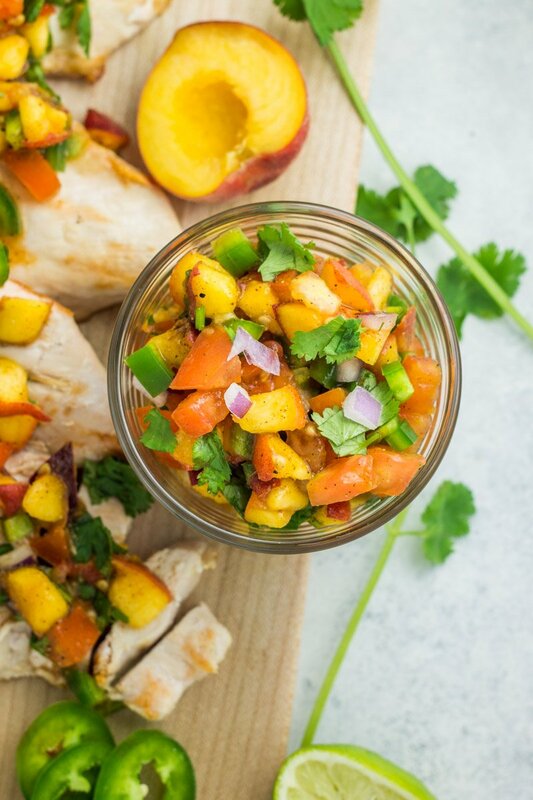 If you’re looking for a way to jazz up your grilling grub this summer, this grilled chicken with jalapeño peach salsa is where it’s AT. And here’s a little tip, you don’t HAVE to grill the chicken. I mean, you could make it in the oven, over stovetop, or in the microwave (ok no, don’t do that), and still enjoy this fab dinner on rotation. Grilling just makes me feel BA, mmmmk? The salsa in this dish is made up of simple ingredients that combine beautifully for a big punch of flavor. I chose to dice all the components for chunkier salsa, but you could certainly throw it all in a food processor and pulse a few times for easier creating, and a smoother texture. Like yours with a little heat? Add a few of the jalapeño seeds in the mix for a big kick! Summer is for grilling lovers! 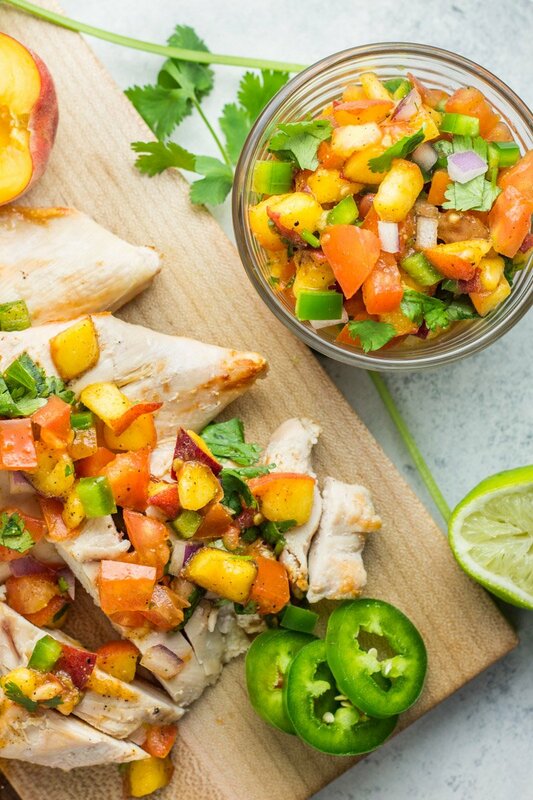 For more healthy summer recipes, check out these Orange Balsamic Grilled Brussels Sprouts, Carne Asada with Tomatillo Watermelon Salsa, Sweet Onion Teriyaki Salmon Packets, 5-Ingredient Whole30 Hawaiian Chicken Burgers. Make the salsa beforehand and refrigerate until ready to serve. And double the batch for a great snack paired with tortilla or pita chips! Oh my gosh, I have to have that salsa! Can already taste the spicy and sweet balance! So jealous that your neighbors have a peach tree! I have to pray that grocery store is stocked with peaches when I go, lol. But as soon as I get my hands on some peaches I’m making this recipe! I hope you found a good stash of them Patricia!